I'm having a Hell of a time trying to find Maintenance free Deep cycle batteries in town. I've had AC Delco Voyagers in there for 6 years and they are finally giving up. I'm looking for 2 maintenance free Group 29 or 31 Non-AGM batteries. Any suggestions? I did that, it's only populating with Old Posts from 3-5 years ago. As I understand, Maintenance free batteries are getting hard to find now. So maybe someone who's bought one recently will chime in. I could be mistaken, but I think the new buzzword is sealed vs maintenance free. I have NEVER had this much problem finding batteries in Nashville! Batteries + sells the Duracell AGM deep cycles also. Adrian,I am not sure if they have what u need but you might call interstate battery distributor in Lebanon.They are on highway 109 just before highway 70. I have had good luck with interstate over the years but last ones i bought came from Wally World. Dang things are getting expensive like everything else. Lot folks on BBC are getting batteries from sams. I think I have stated this before ... When I was guiding I was sponsored by a couple of Battery Manufactures... But to be honest the best batteries I have used was the Walmart Batteries which are made by Johnson Controls. That's the thing. Every shelf is empty, the website says unavailable. Like I said, I've NEVER had this much trouble trying to get back on the water! 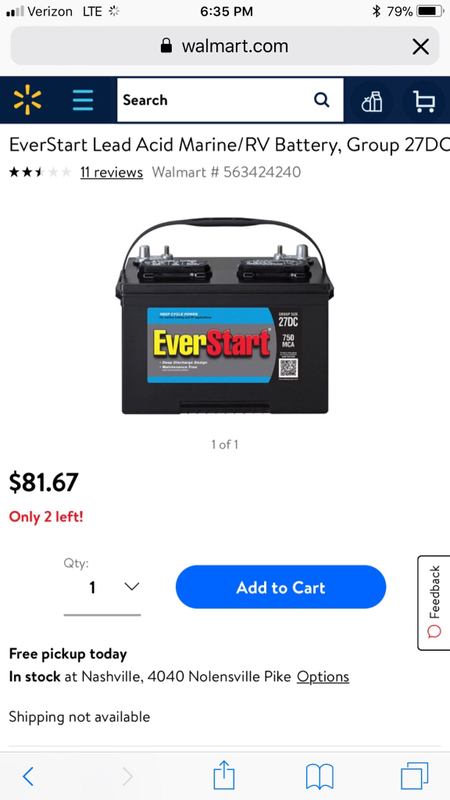 Is this the type battery you guys are referring too?